Audio Visions is the largest single source production company in the Midwest, providing you with solutions for all of your production needs. 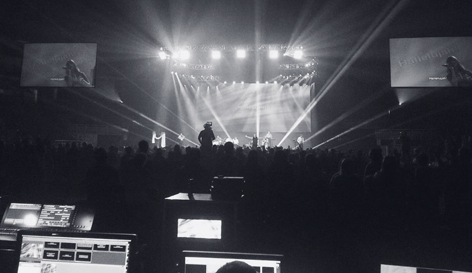 Whether you need audio, video, lighting, or staging we have the ability to customize a solution for you. We offer expertise in all facets of event management, which are customized to be the ideal solution for your event. Audio Visions’ diverse range of events includes music festivals, concert series, arts festivals, sporting events, food festivals, community events, corporate events as well as popular entertainment venues. The Audio Visions team has many years of professional experience. We understand that creating a successful event takes more than a great idea and exciting programming. Our team will work tirelessly to orchestrate your event to provide you with a solution your guests will remember. Audio Visions was founded over 30 years ago. We strive to provide professional integrity and a dedication to providing unparalleled service that has allowed Audio Visions become to the Midwest’s largest single source, production company. Our clients benefit from the Audio Visions’ experienced staff and their ability to customize a solution to meet their needs.